Ahead of the 2018 World Cup, football fans in Nigeria will have the opportunity of seeing the real FIFA World Cup trophy when it arrives in the country as part of the fourth tour organised by Coca-Cola. Nigeria will be the seventh African country on the 2018 FIFA World Cup Trophy Tour itinerary after Uganda. The trophy will be in Lagos and Abuja from the 7th – 10th of March. 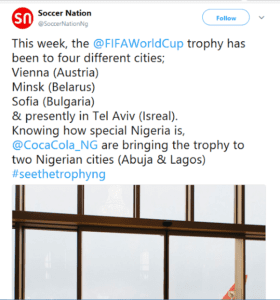 According to reports, the FIFA World Cup trophy has been to other different cities such as Vienna (Austria), Minsk (Belarus), Sofia (Bulgaria) and Tel Aviv (Israel). The tour will give football lovers the opportunity to get ready to taste the feeling of the world’s largest, most anticipated sporting event – the 2018 FIFA World Cup. 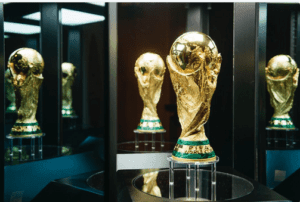 Managing Director, Coca-Cola Nigeria, Bhupendra Suri, said through the FIFA World Cup Trophy Tour, Coca-Cola intends to inspire thousands of World Cup fans in Nigeria as they experience the real, one-of-a-kind, solid-gold FIFA World Cup Original Trophy.